MS7250 Single Quadrupole GC-MS 는 정확도, 신뢰도, 정밀도가 높은 제품으로 일반적인 mass 분석뿐만 아니라 응용 분석에서도 그 성능이 뛰어납니다. MS7250 MS 는 식품안전, 환경보호, 재료화학산업, 생명과학, 의학연구 그리고 범죄수사 등 다양한 분야에서 널리 사용되고 있으며 높은 성능과 확실한 A/S를 보장합니다. EI electron impact source, with dual heating robs independent heating which makes heating more uniform. Max temperature is 350℃. Dual filament design provides double filament life. Electron energy 10-100eV adjustable, enabling low-voltage operation to meet application requirements. Tube-shaped lens enhance focusing effect and dramatically improve ionization efficiency. Patented surface repulsion electrode design dramatically improves ion focusing effect. 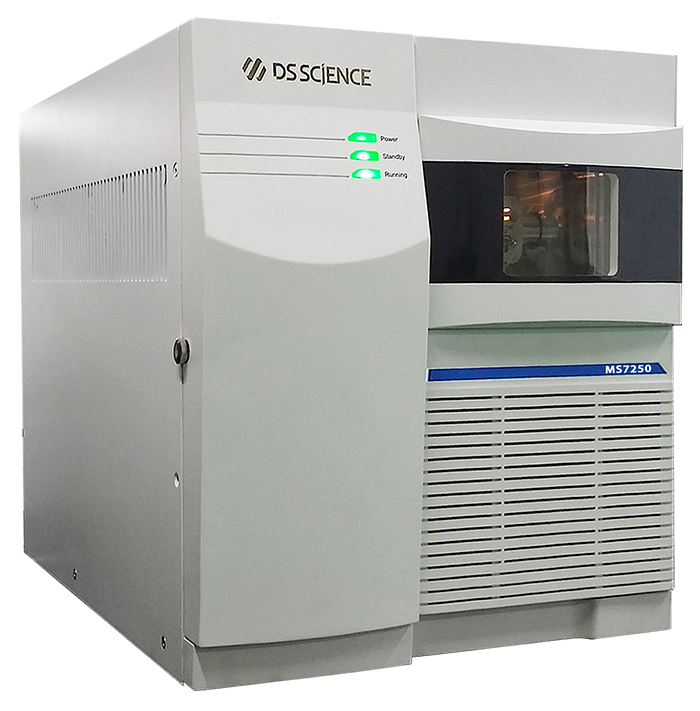 High precision metal molybdenum quadrupole mass analyzer, to achieve standard unit mass resolution. Removable pre-quadrupole filter device, to reduce pollution of main quadrupole and avoid cleaning maintenance. 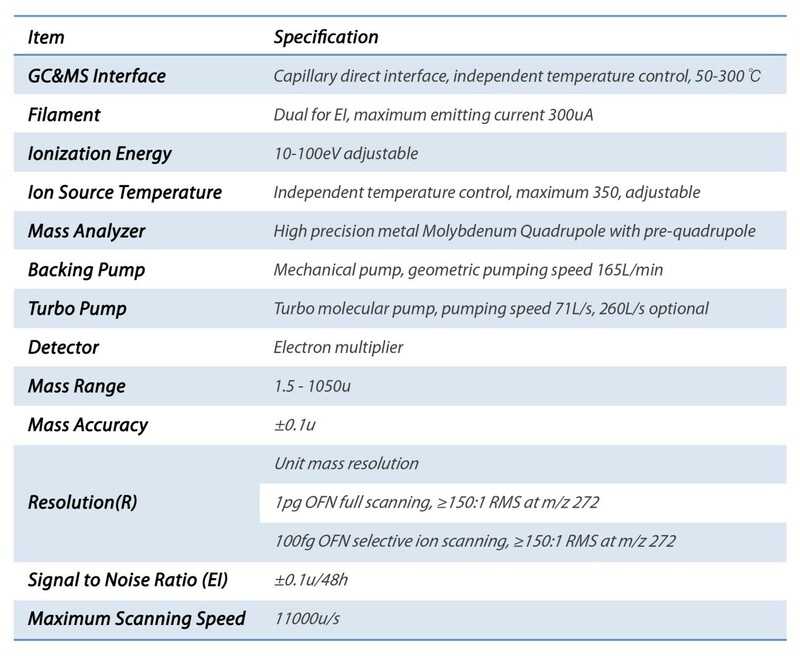 Pre-quadrupole equipped with scanning voltage with mass changes, to ameliorate fringing field, improve efficiency of ion incidence and achieve better detection sensitivity. High performance pre-vacuum pump and turbo molecular pump, to reduce ion collisions, background noise and memory effect. Pre-vacuum using GLD-136 small direct oil rotary plate pump geometrical pumping speed 165L/min. Stage-vacuum using Germany PFEIFFEER innovate Hipac™ turbo-molecular pump with a more reliable design compact structure, higher pumping speed and more efficient cooling system. To suit your specific needs and budget, 2 specification are available. Cleaning is an essential maintenance process for an ion source, prequadrupole system. MS7250 supplies a side door design of the vacuum chamber, which makes cleaning much easier, routine maintenance much more simple.